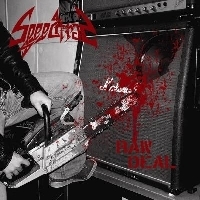 EXCITER, SAXON, MOTÖRHEAD and DIAMOND HEAD comes to mind when I listen to ‘Raw Deal’ even though that SPEEDTRAP is faster than both SAXON and DIAMOND HEAD. We get 6 tracks limited to 500 copies on vinyl. The music is filled with energy but the song writing isn’t that strong in my humble opinion. And the singer is horrible at times. Maybe it’s just me... but the 6 tracks do almost nothing for me. Don’t get me wrong ‘cause I dig 80’s (speedy) heavy metal but I have stumbled across better bands lately. Check ‘em out and be your own judge because there are certainly quite good riffs to be found, but it is simply not enough to satisfy a spoiled reviewer like me.